Season Five premieres Monday, Sept. 24 at 8 pm with details on a 2,700-year old temple tied to the Biblical tale of Jonah and the Whale discovered in Iraq that was destroyed by ISIS. Archaeologists investigating a site in Iraq destroyed by ISIS have discovered a 2,700-year-old temple that reveals new insights into one of the Bible’s most famous stories, “Jonah and the Whale.” That’s just one of the revelations explored in the new season of Smithsonian Channel’s popular series SECRETS, which follows the world’s leading archaeologists as they use modern technologies to solve some of history’s oldest riddles. A mysterious tomb from the final days of the Vikings, a forgotten princess of Egypt and the true origin of King Solomon’s mines are among other startling finds revealed in season five of SECRETS, which premieres Monday, September 24 at 8 p.m. ET/PT on Smithsonian Channel. JONAH AND THE WHALE kicks off the fifth season with a modern-day disaster. 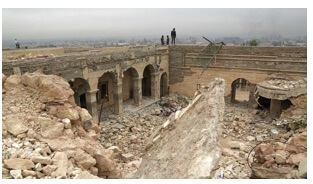 In war-torn Iraq, ISIS fighters in Iraq detonate explosives under the shrine of “Nebi Yunus” – the Tomb of Jonah – destroying a site sacred to three religions. But when ISIS flees, archaeologists discover that beneath the rubble lies a 2,700-year-old temple complex, an ancient Assyrian palace previously unknown to history. Dr. Katharyn Hanson is an archaeologist with the Smithsonian Institution’s Museum Conservation Institute. She was relieved to discover that ISIS’ destruction wasn’t complete: “The archaeological artifacts are still there,” she explains in the film. “That’s the part that gives me hope.” Massive sculptures, cryptic inscriptions and mysterious figures reveal the story of a cruel despot, a dark fertility cult and a character who may have inspired one of the Bible’s best-known tales. The 2012 discovery of a Viking tomb in suburban Denmark caught the archaeological world by surprise. Inside the vast underground chamber was a Viking lord’s weapons, his gold-encrusted jewelry and even the body of his horse … but no Viking. The empty grave unlocks the mysteries of the final days of the Age of the Vikings. Cutting-edge archaeology reveals how this war-like culture successfully competed with the finest armies of Europe. New revelations uncover the shocking force that caused the Viking Age to collapse and what made Viking corpses disappear from their tombs. In March 2017, construction work in Cairo’s urban outskirts is called to a halt, as the colossal stone head of an ancient pharaoh is uncovered by a forklift. The “Pharaoh in a Slum” makes international headlines, but the real news is that the massive statue represents a ruler lost to history. Researchers combine hieroglyphic research and ancient documents to put together the real story of this “Lost Pharaoh” who brought Egypt back from the brink of collapse and ushered in an artistic renaissance – before his name and memory were wiped out. In the cemetery of Egypt’s earliest rulers, archaeologists were shocked to find the carefully buried corpses of baboons, jackals, leopards and even a hippopotamus. Forensic evidence shows these animals were not native to Egypt, and were captured at faraway locations. Why did these ancient Egyptians treat these animals like honored guests, even burying them with the royal family? New revelations show that this “world’s first zoo” may have been the foundation for the ancient Egyptian religion – and the source of Egypt’s mysterious animal-headed gods. For centuries, scholars, adventurers, saints and thieves have searched for the wealthiest treasure mentioned in the Bible: King Solomon’s mines. Though scripture calls Solomon “richer than any other king,” ancient Israel seems to have no silver or gold mines that could explain the gold-covered Temple and palaces of Jerusalem. But startling new discoveries in the remote Israeli desert finally reveal the truth behind the legend: a long forgotten mine, an ancient metal-working encampment, and traces of a metal far more precious than gold. SECRETS is produced by Blink Films for Smithsonian Channel. Dan Chambers is producer for Blink Films. Tim Evans and David Royle are executive producers for Smithsonian Channel. Smithsonian Channel™, owned by Smithsonian Networks™, a joint venture between Showtime Networks Inc. and the Smithsonian Institution, is where curiosity lives, inspiration strikes and wonders never cease. This is the place for awe-inspiring stories, powerful documentaries and amazing factual entertainment, available in HD and 4K Ultra HD across multiple platforms. Smithsonian Channel, winner of Emmy® and Peabody awards for its programming, combines the storytelling prowess of SHOWTIME® with the unmatched resources and rich traditions of the Smithsonian, to create programming that shines new light on popular genres such as air and space, history, science, nature and pop culture. Among the network’s offerings are series including Aerial America, America in Color, The Lost Tapes, Mighty Ships, Million Dollar American Princesses, The Pacific War in Color and Air Disasters, as well as critically-acclaimed specials that include The Coronation, The Mountain Lion and Me, Earth from Outer Space and Titanoboa: Monster Snake. Smithsonian Networks also operates Smithsonian Earth(TM), through SN Digital LLC., a new subscription video streaming service delivering spectacular original nature and wildlife content. To learn more, go to www.smithsonianchannel.com, or connect with us on Facebook, Twitter, and Instagram. THIS POST HAS BEEN READ 24503 TIMES SO FAR. THANK YOU! The tale of Jonah? It’s not a tale, fool. It’s a narrative.